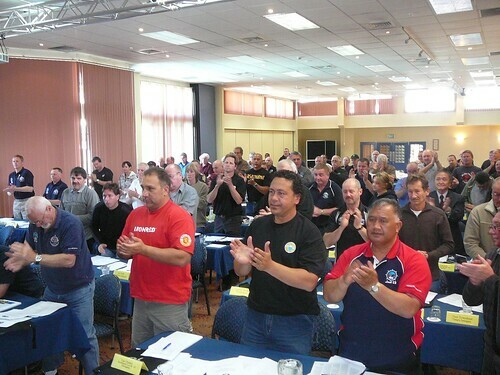 Maritime workers from around the world have gathered in Wellington this week as the Maritime Union of New Zealand holds its third triennial conference. The three day conference sets the agenda for the next three years of the Union and runs through to Thursday 29 October. The conference was opened this morning by Leader of the Opposition Phil Goff. Delegates and observers from throughout New Zealand and from USA, UK, Japan and Australia are attending the conference. International speakers addressing the Conference include Maritime Union of Australia National Secretary Paddy Crumlin, All Japan Dockworkers Union ZenKowan Deputy General Secretary Shosaku Machida, International Longshore and Warehouse Workers Union (North America) Vice President Ray Familathe, and RMT National Secretary Seafarers Division Steve Todd (United Kingdom). The Conference will also be the last for long serving Maritime Union General Secretary Trevor Hanson who retires next month after 37 years of active membership and leadership within the Maritime Union and the former Waterfront Workers Union. Elections for the Maritime Union’s four national officers are currently being held by postal ballot.